The Canon Automoteur DE 75 mm SAu 40 (DE 75 mm Self-Propelled Gun SAu 40) is a Rank II French tank destroyer with a battle rating of 2.0 (AB/RB/SB). It was introduced in Update 1.75 "La Résistance". It distinguish itself by its very tall cupola and thick gun barrel. 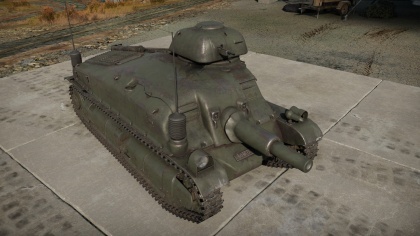 This tank is equipped with APHE rounds, a rare feature in the French tech tree. As it was developped from the French S.35, this tank shares many of its characteristics such as ~40 mm cast hull bolted onto the chassis, which is barely a widened version of its original. The track system is mostly the same as on the S.35, with 25 mm plates covering the roller wheels. As for the hull, its two 8 mm grilles over the engine compartment and doors on the side reinforces the impression that it's just a widened S.35 hull. As this tank is based off the S.35, it shares many of its attributes when it comes to armour. A slight angle can defeat most shots this tank will take at this BR, this is useful to know when getting into position: from a distance and not showing neither side nor front to the enemy, you should be safe. As for frontal armour, its 40 mm overall thickness is not strong enough to withstand anything bigger than AA fire. But, a thing to consider with this weird pattern is its "bouncy" behaviour, principally around the gun mantlet: complex angles may just bounce some shots, making them loose some energy before hitting the main armour, this feature is peculiarly distinctive at gun's height. 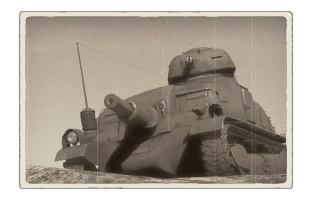 The main weakness of this tank is its very tall commander's cupola, which makes it quite easy to spot and destroy, as it is thinner than the main armour. Any APHE penetrating this area will knock out the tank's commander, thus disabling its only MG and some shrapnels may even damage or incapacitate the driver, disabling this tank for good. A way to avoid getting spotted too easily is buying camouflage for the front cupola area, making it look more like a bush popping out a hill than a tank's turret. Try to hide the tank's lower hull part as it is only 35 mm thick. Turret underside is 20 mm thick. Turret ring is 30 mm thick. Turret base is 34 mm thick. While being mounted on a widened S.35 hull, this heavier tank has about 70 HP less than its predecessor, making it quite slow and unwieldy. In order to fulfill the task of getting into position, one should choose its route wisely and avoid risky spots as this tank's awful reverse speed and hull turning rate makes it quite bad at hasty retreats. Mobility with the Somua 40 is an issue. It is arguably what makes this tank hard to master as it does not allow for good map placement. As any casemate SPG, this tank's main feature is its main gun...kind of. With average penetration rates for this BR with a maximum of 73 mm at point-blank ranges (comparably, the Russian SU-76M penetrates 80 mm with its basic APHE shell and up to 135 mm with APCR shots). While being one of the rare French tank shooting APHE shells, increasing its one-shot potential, this round noticeably fails to explode when flanking enemies as this round takes 25 mm of steel to detonate. Another concern being its slow horizontal traverse, which makes it hard to react to fast-paced situations. This gun placement makes this tank quite vulnerable: being low, it exposes the SOMUA 40 to enemy fire when popping up a hill. 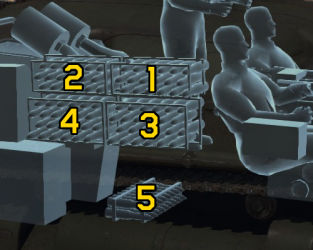 Ammo racks of the SAu 40. As for the turreted MAC 31 MG, it does not helps at anything more than taking down truck-mounted guns. This turret is slow, which negates the possibility of chasing planes with it. It also has poor rate of fire and is low calibre, so even if you manage to hit a plane, it will not do much to it. The Somua 40 behaves as a classical casemate SPG as it should provide its teammates with superior firepower from medium to far distance, behind the frontlines where it will be harder to flank. As this is its purposed role, this tank has some issues accomplishing it. The first being its relatively low penetration and shell velocity, which makes long range engagements (>750 m)a bit hard to manage. The second being bad mobility, which complicates the task of positioning. Act as a classical SPG while keeping in mind your slow pace. There is nothing very much interesting nor special you can do with this tank. Decent 75mm cannon with explosive filler gives it good one-shot potential. "Terrific" MAC 31 gun mounted in cupola. Good HE shells for dealing with SPAAs. Depression and elevation angles are acceptable. Armour is quite thick on all sides. Commander's cupola is badly designed. Turret-mounted 7.5 mm MG does not allow for shooting down planes. Makes it easy to spot while bringing no tactical advantage. Three crew members can quickly lead to combat efficiency loss. Huge ammo rack near gunner makes it easy to one-shot. The SAu 40 self-propelled gun was developed by the SOMUA company between 1935 and 1937 as part of the same order the French cavalry placed for the S35 tank. The two tanks combined were intended to equip light mechanized divisions of the French army and support the larger “battle tanks” (chars de bataille). The vehicle inherited the S35’s characteristic chassis with a redesigned front section of the hull to accommodate the 75mm APX cannon. In addition, the rotating turret on top of the fighting compartment was redesigned to a commander’s cupola and moved to the side of the vehicle, but the turret’s 47mm cannon was replaced with a single 7.5mm machine gun. The body of the SAu 40 was ready by 1937, but it couldn’t be immediately completed. Because the cannon was not yet ready to be installed on the chassis, SOMUA engineers had to wait nearly 2 years before the cannon was finally made available. It wasn’t until 1939 that the fully assembled prototype was completed, and orders for mass production were received in October of the same year. Whether or not any additional vehicles other than the prototype were built or if the vehicle took part in active fighting is unknown. This page was last edited on 31 March 2019, at 16:30.